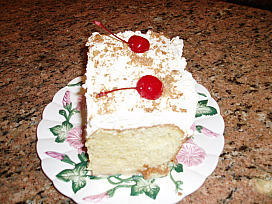 I had to learn how to make this tres leches cake recipe because it is my favorite Mexican dessert. Remember Lissy? She is my wonderful friend in Mexico. She shared her family’s tres leches recipe so I am passing it on to you. As great as her recipes are, the wonderful stories about her family are just as great. I love hearing them! The following is her story about the tres leches cake recipe. 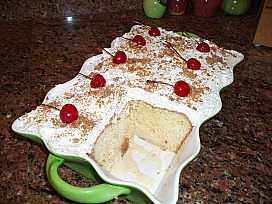 I do love this tres leches cake from Lissy. I may not have put it together just like Lissy does, but it was easy and very, very delicious! Thanks Lissy, for all your help, your family stories and your recipes. Grease and lightly flour a 9x12 inch baking pan or an oblong baking casserole dish. Beat egg yolks, sugar and vanilla until light and creamy. Add the sifted flour and milk and beat until blended and smooth. With a large spoon gently fold the beaten egg whites into the batter until you barely see any of the white showing through. Dump mixture into baking dish; smooth out and bake about 45 minutes or until brown and pick comes out clean. Let set until cold. Combine the evaporated milk, half and half and the sweet condensed milk in a bowl. Whisk (whip) it together until it is all blended. NOTE: I like the flavor of alcohol but do not like alcohol so I put 1 cup of the milk mixture in a saucepan with the sugar and rum. I heated it only until it started to bubble; then removed it from the heat to cool. I then added it back into the container with the other milk mixture. You can do it this way or just put it on the cake without heating. Punch holes all over the cold cake so the milk mixture can saturate the cake. (Lissy says to “torture the cake”. Rather than using a toothpick like I normally do, I used a skewer to poke the holes all over the cake) Slowly spoon all the milk mixture over the cake. It should totally absorb into the cake. Cover with whipped cream. Dump whipping cream into a large mixing bowl. Add the vanilla and start beating on high speed. Gradually spoon sugar into the whipping cream and beat until stiff peaks form. Spread over the milk saturated cake. Optional: Garnish with nuts and cherries. NOTE: I ground a few walnuts, added ½ teaspoon sugar and ¼ teaspoon cinnamon and sprinkled over the cake. I topped with maraschino cherries. Place tres leches in refrigerator for a couple hours before cutting and serving.